Slappy the Dummy is back! The diabolical villain from the first GOOSEBUMPS movie based upon the popular children's horror novels by R.L. Stine is continuing his evil terror spree haunting a new cast of characters in this sequel film. I'm looking forward a spook-tacular family movie night with my wife and kids watching GOOSEBUMPS 2 now that is out on Blu-ray and DVD and want you to have a terror-ific time too. So a geek daddy is hosting a movie giveaway and sharing some fun activities your kids will die to do. In GOOSEBUMPS 2, Gummy Bears transform before your eyes into devious monsters. Slappy has written down some directions for us on different ways you can change your own Gummy Bear candies including making them glow in the dark. Glow in the dark Gummy Bears are so BOO-tiful they'll give you goosebumps! Make your family movie night both educational and entertaining by doing these science experiments together with your kids before watching GOOSEBUMPS 2. Plus the left over Gummy Bears will make a great treat to snack on during the movie. Have a teachable moment about the science of chemical reactions by transforming some Gummy Bears into slime. Of course any good ghost story or monster movie has to have some slime to go along with it. Make your own slime to squish and squash while watching the GOOSEBUMPS 2. Hey it is even edible if you dare! 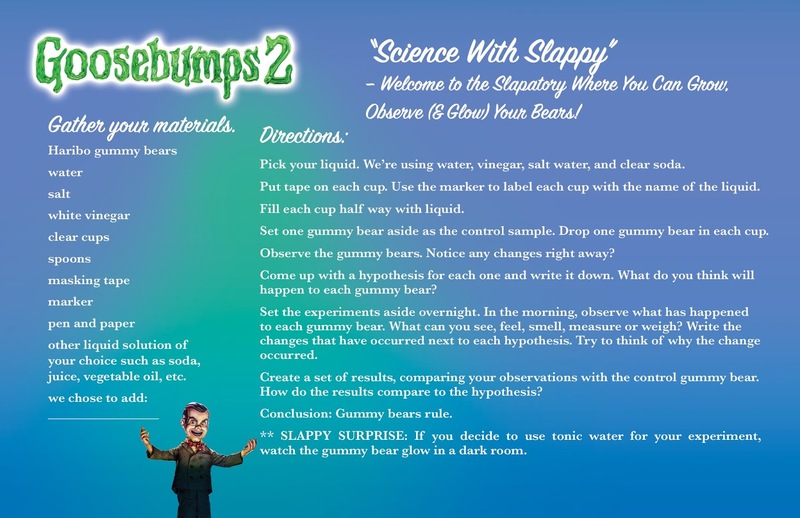 Make your family movie night both educational and entertaining by doing these science experiments together with your kids before watching GOOSEBUMPS 2. Plus the left over Gummy Bears will make a great treat to snack on during the movie. Of course you need a movie to have a family movie night. 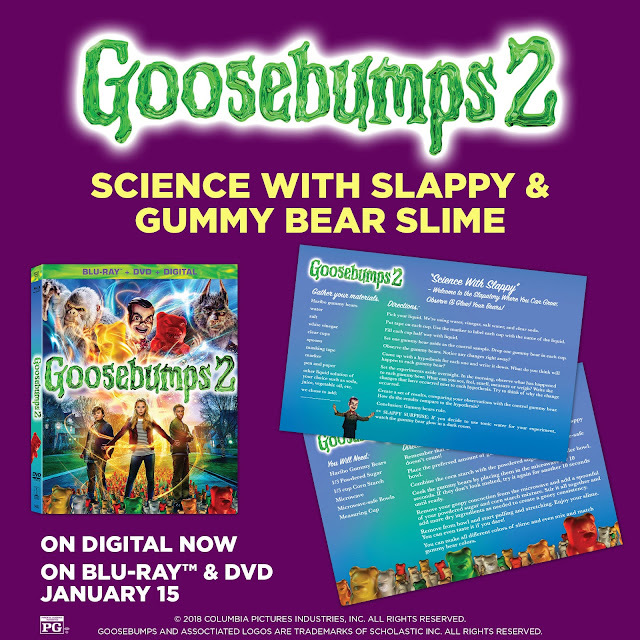 Thanks to Sony Pictures Home Entertainment, ageekdaddy.com has a GOOSEBUMPS 2 Blu-ray + DVD + Digital combo pack of the film to giveaway. In addition to the motion picture, the home entertainment release also has special features that include deleted scenes, Slappy's Audition Tape, a gag reel, and a "Meet the Monsters" segment. For a chance to win, just complete the entries in the form below before 11:59 pm on January 28, 2019. Good luck to all our entrants! One lucky winner will be selected from all eligible entries. Sony Pictures Home Entertainment reserves the right to disqualify a winner if they have won this prize from another site hosting this promotion. Must be a United States resident over 18 years old to be eligible to win. A Geek Daddy will randomly select the winner of this movie giveaway but Sony Pictures Home Entertainment will be responsible for the delivery of the prize. For more information about the film go to goosebumps.movie/. 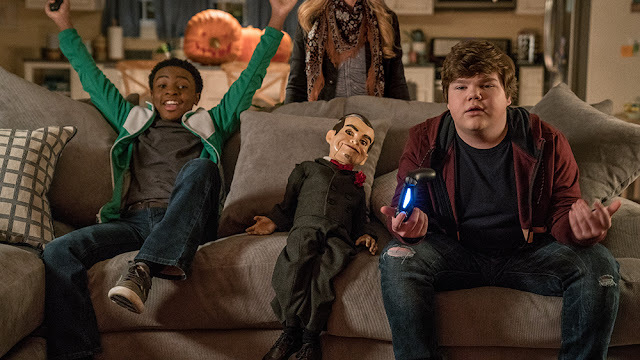 Rated PG for tame terror, GOOSEBUMPS 2 is now available on Digital as well as Blu-ray and DVD to add to your home entertainment video library. If you enjoy the Goosebumps movies, check out the Horror Town game app for Android and iOS devices that lets you build a city populated with monsters from the R.L. Stine novels. Have yourself a scary good night of family fun with GOOSEBUMPS 2!